The Bliss Hotel is really a unique place to stay in Mahe. 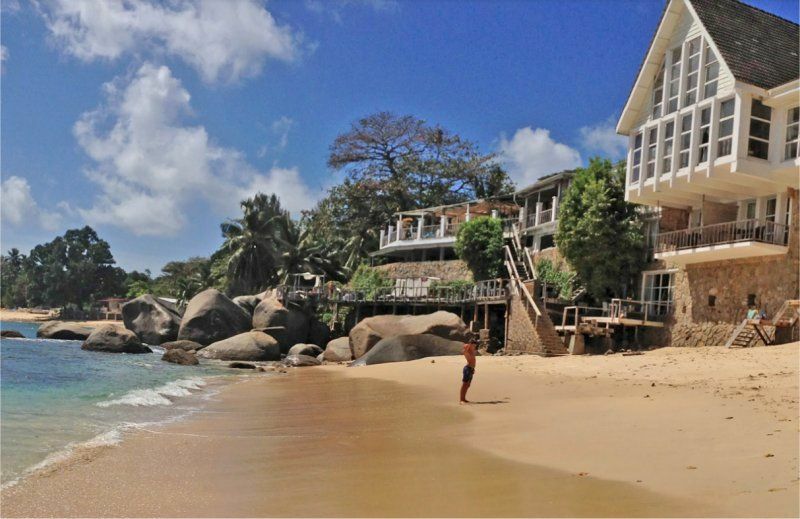 It is situated north of Mahe at Glacis next to a small nice beach. Some of the rooms and suites are directly facing the sea others are on the hill side few steps to climb but very nice rooms and duplex. A nice small beach is just next to the hotel. The Bliss Boutique Hotel is really an unusual place , a 4* hotel (non official), astonish site, the design of the rooms is using only natural materials and very epurished to make it an unique place to stay in Seychelles. The Bliss is only 30 minutes drive from the international airport, 15 minutes from the capital Victoria and cat coco Jetty and only 15 minutes from Beauvallon Beach and all its cafe restaurants and the biggest beach of Seychelles where all nautical sports are possible event motorized ones. 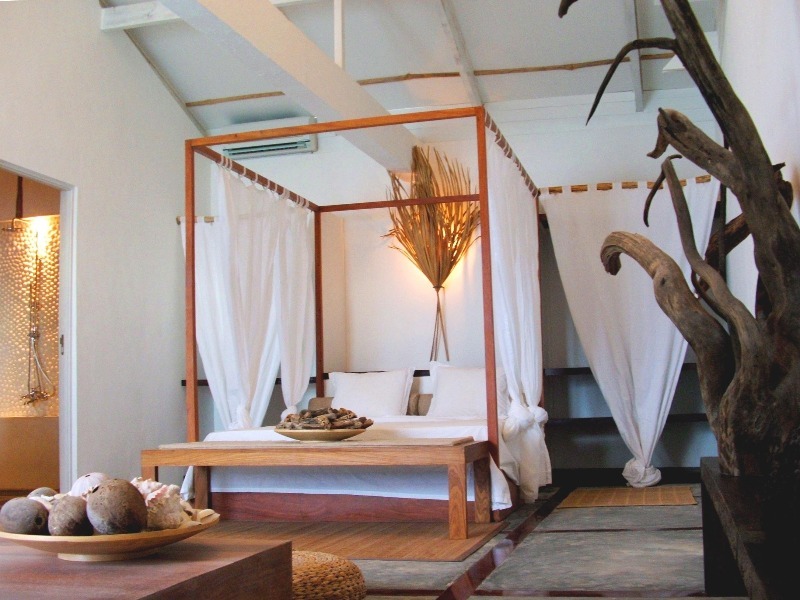 The Bliss hotel & boutique hotel is a 4* (no local classification) charming hotel situated in the north east coast of Mahe island overlooking a nice small sandy beach. There is also a nice swimming pool overlooking the sea situated on the hill side of the hotel. 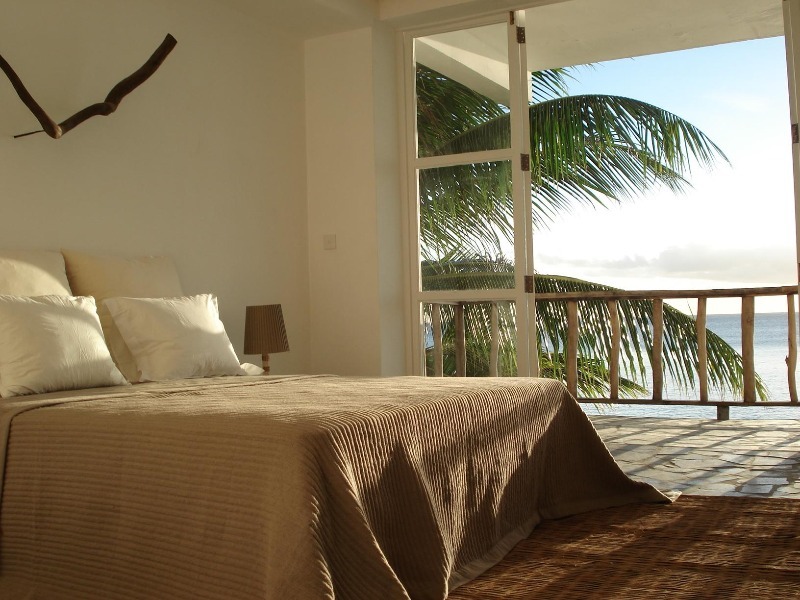 From the terrace of the Sea front rooms you will enjoy an amazing view over the Indian Ocean. At Bliss hotel you will enjoy your holidays. 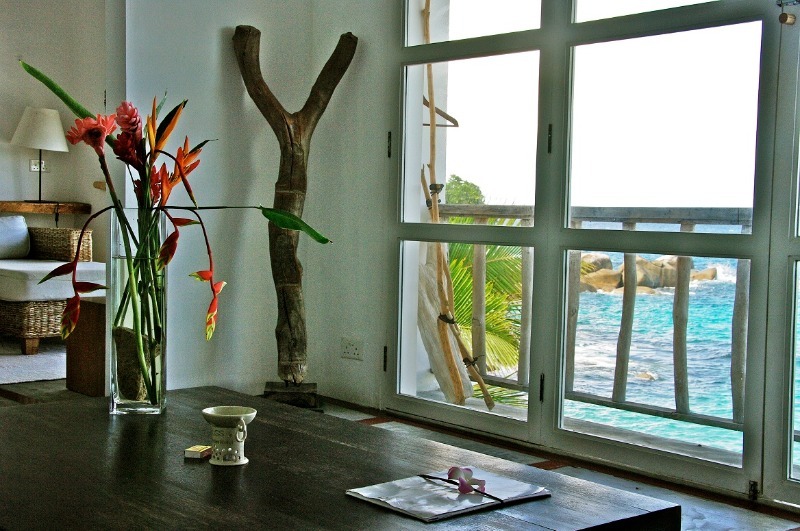 The 2 Rooms Zaviron and Coral (35sqm) have an open bathroom as well as a private balcony with an amazing sea view. The 2 Junior Suites (45 to 55 sqm) includes a 1 bed Room, a lobby, a large bath room for a better comfort. The 3 Suites, Birgo, Wave, & Takamaka (60 to 80sqm) are composed with 1 bedroom, a lobby, a separate bathroom for a maximum comfort. The Master Suite (120sqm) includes 3 bedrooms and 2 bathrooms as well as a balcony offering a splendid view over the Indian Ocean. 6 Standard Garden View Rooms,(35 to 40 sqm) include one bedroom a lobby, a bathroom, a terrace, garden view. 6 Deluxe Garden Seaview Rooms, (35 to 40 sqm) includes a large bedroom, a lobby, a bathroom with shower, a garden or terrace with a nice view over the ocean. 2 Family Garden Duplex (75 to 80 sqm) includes 2 bedrooms, a large lobby a bathroom 2 terrace with a nice view in the Secret garden. With a spectacular view of the Indian Ocean, private terrace, open space sea view bathroom and separate shower and can accommodate a maximum of 2 persons on a bed and breakfast basis. 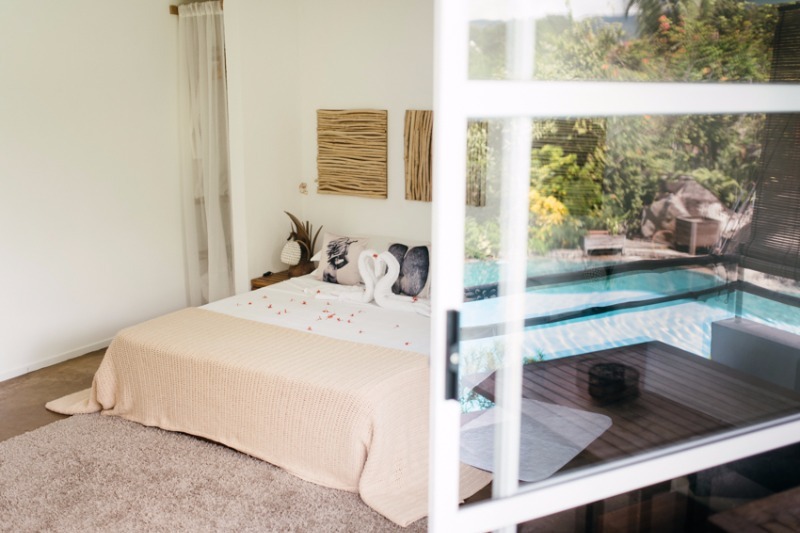 Nice large room with Garden view, private Terrace and a separate shower and can accommodate a maximum of 3 persons on a bed and breakfast basis. 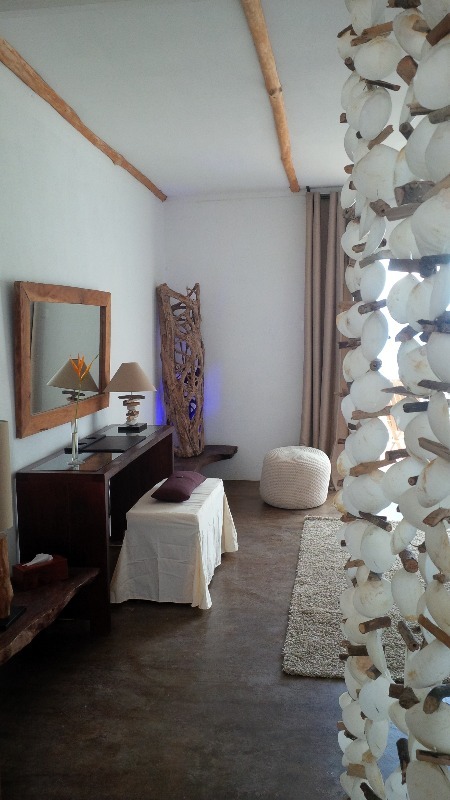 Very large room with spectacular ocean view, a private terrace and panoramic shower and can accommodate a maximum of 3 persons on a bed and breakfast basis. Spacious three bedroom apartment with a spectacular view of the Indian Ocean, living room with a panoramic balcony, one bathroom, one shower, one toilet. Can accommodate a maximum of 6 persons on a bed and breakfast basis. Spacious room with spectacular view of the Indian Ocean, private terrace, relaxing area, and a large natural sea view bathroom and can accommodate a maximum of 3 persons on a bed and breakfast basis. Nice large room with garden view, private terrace and separate shower and can accommodate a maximum of 5 persons on a bed and breakfast basis. With a spectacular view of the Indian Ocean, natural open sea view bathroom overlooking the hotel private bay and can accommodate a maximum of 2 persons on bed and breakfast basis. The terrace "Barefoot" overlooking the sea offers a nice breakfast all fresh with local product. For lunch you have a large choice of salads and international dishes but also you will always find a Seychellois Creole specialty! Around 6-7 pm enjoy a nice tropical cocktail before your Creole buffet with more than 15 different dishes. For a seafood diner try the Rock pool experience cozy and elegant atmosphere. To notice that the supplier have the right to get the balance before your arrival. In case of cancellation fees will be billed directly by the following supplier:"Bliss Hotel".